You can flip this card into face-down Defense Position once per turn during your Main Phase. When this card is Flip-Summoned, return all monsters on your opponent's side of the field to the owner's hand. Personally, I don't like Guardian Sphinx in anything but a few control type decks. The fact that it's a Tribute Monster makes me steer away from it. Yeah, the Effect is very nice, but all in all Guardian Sphinx is an easy target for Nobleman of Crossout. It is possible to keep your opponent in check with Guardian Sphinx and the right assortment of cards. Preferably for an Exodia based deck. But it definitely won't be impossible to demolish the defenses. In Beatdown decks Guardian Sphinx shouldn't even make the Side Deck. There are several reasons for this. The biggest of them being that your opponent will rarely have any more than two Monsters on the Field at a given time. 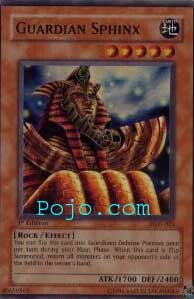 Guardian Sphinx is not a card that's easy to correctly use. Effect: You can flip this card into facedown Defense Position once per turn during your Main Phase. When this card is Flip-Summoned, return all monsters on your opponent’s side of the field to the owner’s hand. This is a hyper Hane-Hane with good atk and insanely good def, and since it has the ability to be flipped back facedown, its effect can be used almost every turn. The thing is if it gets attack while face-down and flipped it's effect doesn't activate since it's not a flip-effect, on the other hand with 2400 def, your opponent will have a hard time destroying if while it's face-down beside NoC of course. This card is almost sick, you can tribute summon it, attack, flip it face-down, then next turn flip it returning all the monsters on your opponents field to the owner's hand, attack, then flip it back face down again, over and over. Which is why it will be restricted to 2-per deck, but was recently taken off the Japanese restriction list, meaning something came out that makes it not as powerful or something. Guardian Sphinx was rated 80 in the top 100 cards last year in Japan, but I expect it to do allot better in the U.S. this year. The only couple downsides I see is NoC and Sasuke Samurai will take it out quick, as well as the very unplayed Major Riot can make Guardian Sphinx’s' effect help rather then hurt your opponent, and that it's level 5 so it requires a tribute, but if you special summon it and use Book of Taiyou and Book of Moon this can can become easily abused. ArtWork: 4.5 - Very Very nicely drawn and it's a cool looking monster.